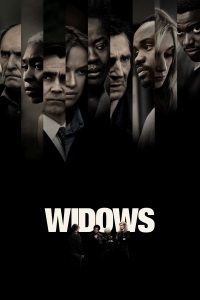 Based loosely on a British TV show that ran for two six-episode seasons in 1983 and 1985, Widows was adapted into a screenplay by McQueen and Gone Girl writer Gillian Flynn. The film is set in Chicago among thieves, politicians, and women who’ve been wronged by life and by the men around them; the system is rigged against them, and the only way they’ll get any approximation of justice and safety is by reaching out and taking it for themselves. It’s a good setup for a heist movie, especially one that wraps its story around Chicago politics. And there’s no denying that Widows is entertaining. Partly familiar and partly something all its own, the film still stumbles at times. But when it works, it’s enthralling. I've never seen a McQueen film before and now I really need to go back and watch his previous works as this one is really just so good. There's so much going on in it that I'm having trouble unpacking it enough to write a review here but I'm so blown away by his creativity and craftsmanship that I want to see everything he'd done. On the surface this is a heist film but the actual heist is one of the least interesting things about it; it's really more about the characters and the world of Chicago politics that they inhabit. I don't know much about Chicago other than what the news reports so I have no idea how accurate the portrayal is but it's so detailed and well observed that I don't really care if it's mostly fiction. I was somewhat amazed when the credit came up at the end thanking the Chicago Film Office since this doesn't exactly show the city government in a positive light. Viola Davis is so good in this but all of the acting is very good, even Farrell who I'm not usually a fan of. And who knows how many films Duvall has left so it was nice to see him get a role that he could tear into. McQueen stages some pretty amazing scenes and shots, the confrontation in the basketball court and the drive from the projects to the mansion are both standouts. That driving scene outside of the limo is really unlike any that I can think of, it seems like one that's going to be shown in film classes for years. The ending with the actual heist seems a little rushed but it's not intending to be Ocean's 11 and the epilogue is a little pat but I'm not a fan of epilogues in general. A lot of movies would be better if they ended about five minutes earlier. Saw it last night and really enjoyed it. There are a few plot holes, but the cast pulls it off. It has the tone of grim cynicism I associate with 70s crime flicks, and that was very satisfying. It seems like a lot of disappointed reviewers thought this would be a funny crime caper movie, and I'm not sure why, given the director. It was okay. It was overall too grim for me - I am okay with criminals doing criminal things, but Widows had a few too many Horrible People doing horrible things. I also felt that there was too much moving-pieces-around-on-the-chessboard: too many characters without backstories, a few weird plot holes, and (because I am a sensitive soul) more horrible things than were really necessary. They're bad people, we get it. I will say that McQueen did an excellent job of creating a mood. It was also beautifully shot without being all art-filmy. Mid-movie, I committed the cardinal movie theater sin of getting out my phone. I did it so I could check Does the Dog Die to see if the pup would be okay. She was, but I did NOT appreciate the tension. Early on in the scene with the pastor, Mulligan refers to the ward's district lines being redrawn, to a loss of 7,000 votes. In one of the last scenes, the beauty shop owner is opening the bag of cash and the radio plays the election results, stating that a late surge of 7,000 votes pushed Jack Mulligan over the top to win. That number seems too specific to be a coincidence. What happened here? Wow, this movie was so good. I wasn't planning to see it but started to hear some really good buzz, so I went today. I loved that it was constantly surprising, and often in really emotional ways. Daniel Kaluuya was genuinely terrifying. I ended up seeing this a month ago with my mother, and we both agreed that the biggest plot hole was that any real Chicago alderman would be much better at money laundering, even if he had gotten everything handed to him. I honestly thought that the art was going to come back into it that way. Some stuff is just basic. The difference between the racism in the father and son Mulligan was also well handled - both racist, but in different ways. I appreciated that the south side exteriors actually looked like the south side - the storefront church looks a lot like a dozen different ones along Halsted, I'm pretty sure that diner is in Woodlawn, and that drive from Oak Woods Cemetery to Kenwood seemed like it would have made sense. The address for the lockbox was either in Oak Lawn or Stony Island, but I remember seeing the 95th street and thinking 'that makes sense'. There were a lot of great little touches in the interiors, too. It felt right. Everyone is so good in this. Farrell even manages to be good in this despite the atrocious attempt at an accent, which is saying something. I was terrified for that dog the entire time, too. In yer bog-standard heist films, the heist is the centrepiece. I liked that it was tacked on almost as an afterthought here. When you set put to make a different kind of movie, you approach it differently. In Reservoir Dogs we do not even see the heist, yet people seemed to like the movie. To me it felt kinda like The Town meets Crash. Not in a somehow good way, either. The only part of the social commentary that seemed strong to me was the friend who "is allowed to feel like she owns" the salon. Viola Davis was incredible in this. Viola Davis is incredible in everything. I enjoyed this one for the most part. Liam Neeson's character's comeuppance was so satisfying. And I too was anxious about the dog and relieved to see that nothing happened to it.